CGI won the (DSP) data service provision element of the Smart Metering project meaning they would work very closely with the DCC to complete their obligations for the government led programme. 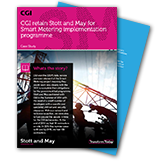 Stott and May partnered with CGI in the Summer of 2014 with the need of a small number of developers with a specific and specialist skill set and security clearance. With our network and technical expertise, we were able to turn around the people in time for the CGI deliverables. At the end of 2014 we had 10 contractors on site. In 2015 this number grew to 80 and by 2016, we had 156 contractors. Find out how and why the relationship evolved.